After a not so great showing at the 2016 Silver State, I found myself in England for the NEO race. This is one of my favorite races all year, I’ve won this race 5 times out of my 7 appearances. The race is at an agricultural college over the Easter Holiday, and they build the track in a building that normally hosts plowing training. The track is normally pretty tight a technical, low to medium grip, and that suits my style very well. Showing up and taking a look at the track, it looked a little different from normal. It had some technical sections, but also looked faster than a normal NEO design. Either way, I was very excited and ready to get on track. My normal pit man, Joe Pillars would be absent for this trip, so I would have a different crew in pit lane, with some younger local Brits. The daughter of the famous Mike Cradock, Tehannah Cradock, and her boyfriend Rhys Herd. I wasn’t sure how the weekend would go, but they both did an AMAZING job in pit lane and Rhys was a HUGE help working on and preparing my cars. Friday would be the first day we hit the track and we would run three practice sessions with the final two being timed and used for seeding into the qualifiers. The NEO race in 1/8 buggy only, with the premier class being Nitro Buggy, and then also having Electric Buggy. I had both my buggies setup with the new Kyosho MP9 TKI4 parts. In practice the track started with more traction than normal and the cars were feeling pretty good. 2015 was the first year that drivers ran the clay compound at NEO, so we all brought clay compound back. I ran P1 with Proline M4 Suburbs to see how my cars felt. In P2 and the rest of practice I would run MC (clay) Suburbs. I made some diff oil changes during practice, but overall I was very happy with both cars, seeding 2nd in both classes. I also got to meet MX and FMX legend, Edgar Torronteras. He is pretty into RC racing and is a HUGE JTP fane, which is awesome. It was super cool to chat RC, MX, family, and watch him drive some. Saturday would be Q1, Q2, Q3, and the Nitro Buggy Dash 4 Cash. I decided to run Proline MC Electrons on both my cars for qualifying, as I though these would be a faster and better tire than the Suburb. Nitro Buggy is up first, and I had a great Q1 going, leading for most of the heat and looking for the TQ. With a couple of minutes to go, I pushed a little wide in the big berm and hit the quad jump too outside, my car jumped nose high and I crashed. It was costly and I went from leading to finishing 4th. Electric I would not even get to start the qualifier as my car just shut down in warm up, and I would DNS. Q2 in Nitro was a very tough race as I made a mistake on the first lap and then just battled traffic and completely lost my rhythm in the qualifier, getting 24th for the round. Q2 for Electric was much of the same as Nitro, a mistake right away and then just surrounded by cars. I was trying to push too hard to make up ground, and the track was very tricky, you had to drive reserved and smart, flow with the track. I would get a 14th. Q3 was here and I wanted some clean runs, as I knew my pace was good. There was one specific area of the track that was difficult for me, the back right table top, right 90 degree turn and small double. This was where most of my mistakes were happening. In nitro I would again not have a clean run, but it wasn’t too bad, finishing 6th for the round. In Electric I would finally put in a solid run and show my pace I’ve had and get the TQ. My cars were good and it felt great to put in a clean last qualifier and get a TQ. Next would be the Nitro Dash 4 Cash. This is where they take the top 15 using two of the three qualifiers ran and set the grid in reverse order. It’s a 10 minute race with the top 3 taking home cash! 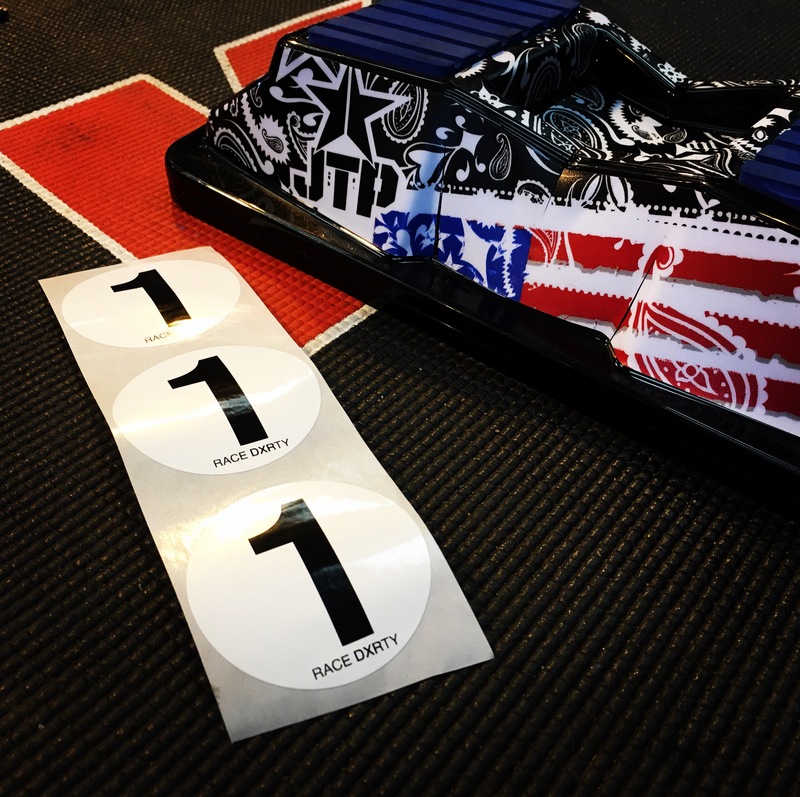 I would start 10th, and I was excited for the race as my confidence was high after getting the Q3 Electric Buggy TQ. The start was CRAZY, I was planning on just going with the flow into the turn 1 berm, but someone who started a couple of spots behind me decided to go inside, so I went inside also to block. We ended up going 4 wide into the berm and there were cars flying everywhere. I came out pretty good, maybe 6th or so, then passed a few more cars on the first lap and was in 3rd. Within a couple of laps I was in 2nd and challenging hard for the lead. I would jump the quad perfect and land on the inside with the leader landing a little long and in the middle, he tried to block me, but I was already committed and on the inside. We touched, but both drove away and I took over the lead. I had some pressure from behind from both Wollanka and Ronnefalk, but I held the lead and never looked back, taking the win. The confidence was starting to build and my speed was finally showing. Mr. NEO, Phil Mortstedt presented me with this AMAZING gift. A hand designed picture of my Kyosho MP9 to celebrate my 5 NEO wins, the car number 5 and then all the years at the bottom. The coolest RC gift I have ever received! Sunday would be the last two qualifiers and some lower finals. Q4 of Nitro would be pretty good, but I was still struggling with that certain section of the track. I made another mistake there and ended up 4th. Electric buggy I was happy with the TQ in Q3 and wanted to keep that rolling. I didn’t do that and I had another super rough round, finishing 16th. Now I was in jeopardy of not making the A Main. For Q5 I made an anti squat change on both my cars, going from 3 to 2 degrees. In Nitro, my car was much easier to drive through that section that had caught me out in every other round, but I still had a silly mistake on the first lap, crashing and dropping WAY back. I drove good and came back to 4th. I would end qualifying with Nitro Buggy with 4/4/4 and 3rd overall. Electric would not be good. In warm up my car would come to sudden stop at the end of the straight, and I would again have a DNS, ending the chance to go straight to the A Main. I would have scores of TQ/14/16 and end up 15th overall. Later that night would be the Electric B Main where they would take the top 4 finishers and bump them up to the A Main. I would start 4th and get a great start to move into 2nd on the first lap, but it would all go wrong before we finished the first lap. The leader cased the little double before the finish and I hit his car, went sent mine off the track, but on the other side of all the traffic for the marshal. I went from 2nd to 15th. The race was 10 minutes and I had plenty of time, so I tried to stay calm and come back through the pack. It was pure CHAOS in the back and I was getting bounced all over the place. I finally started to get in a groove and really gaining time on the top four positions a little after halfway, but then there was a HUGE pile up and I ended up on the front straight, crashed. I lost a TON of time and my race was pretty much over, I ended up finishing 6th and missed the bump by two spots. I was pretty down and disappointed, I had TQ run and wasn’t even going to racing the A Main. I needed to just put it behind me. Monday at NEO is race day, it’s a weird schedule with the Easter Holiday. 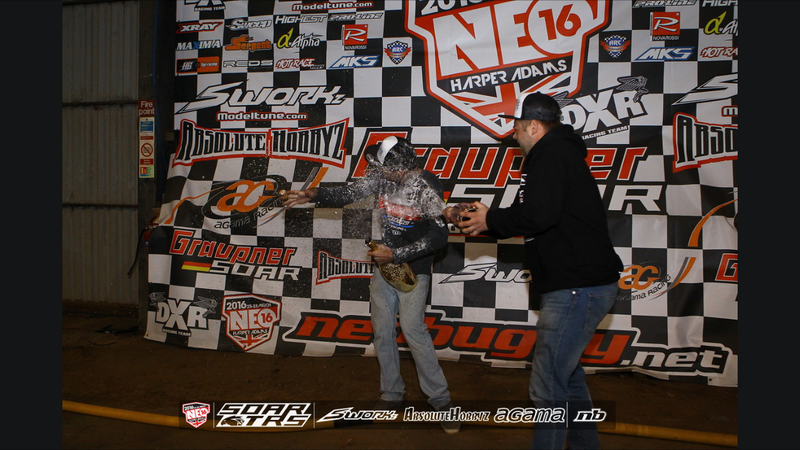 I had put Saturday night behind me and was just ready for the Semi and the Final for Nitro Buggy….I was ready and determined to get my 6th NEO win! After qualifying, you get placed in Even and Odd groups, Semi being the top group. I would start 2nd in Semi A, as I qualified 3rd overall. My goal was simple, drive 20 minutes with no crashes. The race was off and I had a great start, my Kyosho MP9 TKI4 was feeling perfect. Cavalieri and I drove really clean, swapped the lead back and forth a few times, but I took control of the lead just before we made our one pit stop. I drove a clean race and took the win, just like I needed to do. I was 7 seconds ahead of Cavalieri and we both had a faster time than the winner of Semi B, so we would start 1, 2 for the Final. I made no changes to my car, just bolted on a brand new set of Proline MC Electrons, put a fresh clutch on my MX Racing B2R Engine, and I was ready. My plan for the final was to drive smooth and smart. I wanted 45 minutes of no crashing. I was very close on making the 11:15 pit schedule, so the plan was to pit at 10 minutes to have a clean pit lane, then short pit at the end. If I was to crash early and drop back, I was going to go for the 11:15 strategy and take one less pit stop than everybody else. The tone sounded, and we were off….I had the clean start that I wanted and started to pull away some. I had put a small gap, maybe 3 seconds on Cav, but the first group of lap cars that I caught, I got tangled with, and my lead was gone. Cavalieri was now right on me again, but I was confident. The 10 minute strategy worked great and we had a clear pit lane and PERFECT pit stops all race long. I lead every lap of the 45 minute Final and took the win by 20 seconds, taking my 6th NEO Championship! I couldn’t even explain how great that win felt. I am very much confidence driven, and my confidence has been low lately, I needed that win BAD! Thanks to all my sponsors, fans, and supporters, Kyosho MX racing, Team Orion, Proline, KO Propo, Speed RC, JTP, Upgrade-RC, TD Paint, Lunsford, Liverc.com, Rhys Herd, Tehannah Cradock, my family, and the Good Lord Jesus Christ.